The act of creation is unlike lightning as inspiration can strike the same place more than once and there rarely is a singular Eureka! moment. 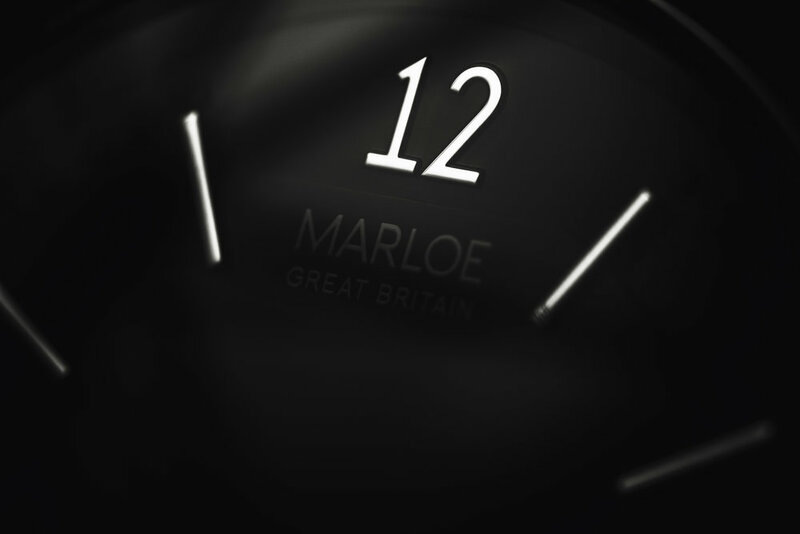 Oliver Goffe, the founder of Marloe Watch Co., has written about the moments of inspiration that led up to him creating the Cherwell with Scottish designer, Gordon Fraser. Oliver has described his feeling of utter disappointment when he changed the battery on his fashion watch only to discover the pitiful quartz movement enclosed by cheap plastic frame inside. No feelings of joy and wonderment were to be found here. He has spoken about how he always loved his father's Smiths Astral, before it was given an accidental burial at sea during a family holiday, and how his football (Soccer, not American) themed watch seemed rather lacklustre in comparison. After a chance meeting with Gordon, they sat down together to create what would become the Cherwell, the brand's first watch. Several prototypes have been created with a Kickstarter campaign scheduled to begin in the beginning of 2016 (1/27/16 Update : The Marloe Watch Co. Kickstarter launched and was funded in just 68 minutes). Rest assured I'll be reporting on any details about the particulars of the campaign when it launches. Photo courtesy of Marloe Watches. The company is named after the quaint English town of Marlow, Buckinghamshire which is only a few miles away from where Oliver (and coincidentally I) grew up. Marlow is a quintessential English town with cobbled streets, swans paddling laxidasically downstream and small thatched cottages nestled between grand country estates. The town has been in recorded history for at least one thousand years being called Mere Iafan in Old English (The Literaltranslation is Land left after the draining of a pond) in 1015 and was recorded in the Domesday book in 1086 as Merlaue. Mary Shelley lived in the town whilst writing Frankenstein and the surrounding countryside has been seen throughout the years in many an English film. In 1969's On Her Majesty's Secret Service, James Bond and his Rolex Pre-Daytona Ref. 6238 visited his superior M at his manor house, Thames Lawn, on the riverbanks in Marlow. The watch itself is named after the River Cherwell, a subsidiary of the Thames, which winds its way through the timeless English city of Oxford. The multi-layered dial is easily the highlight of the watch for me with a raised center section reminiscent of dress watches from the 1950s. Ten rectangular hour markers surround the dial with spaces left empty at 12 and 6 for the brand name and the subsidiary seconds dial respectively. Forty two raised squares act as the minute counters on the very edges of the dial with again space left at 12 and 6 for a large bold twelve and printed HAND WOUND text. The Devil really is in the detail and I really like the grooved sub seconds dial which adds contrasts nicely with the flat raised center. The watch will come in three colored dial variants, black, silver and sandblasted gray with Oliver having discussed in online forums the possibility for a blue dial at some point in time. 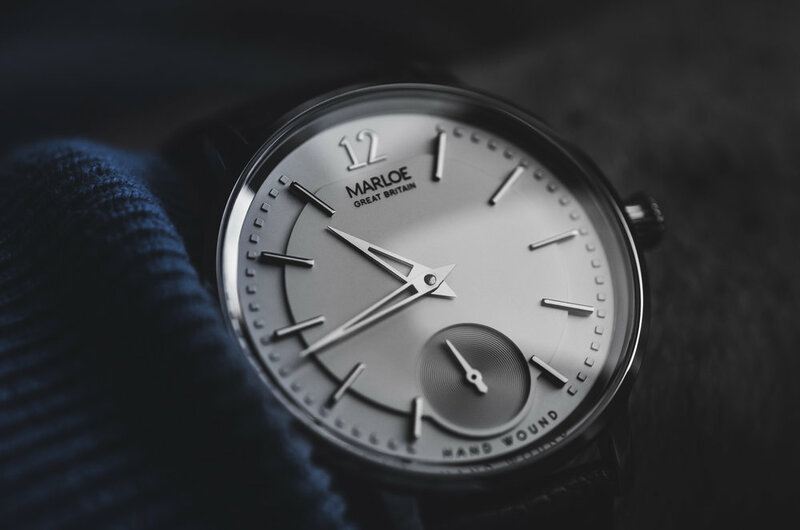 The 316L stainless steel case has a combination of polish and bead-blasted matte finishing with the crown having an M for Marloe engraved on its center. It is rather ironic that I mentioned the Devil before as around the circumference of the caseback is a quote from British author and renowned Christian apologist C.S. Lewis, "The Future is something which everyone reaches at the rate of sixty minutes an hour". The quote is taken from Lewis' book The Screwtape letters, a series of fictional letters written by Screwtape, a demon administrator in the bureaucracy of Hell, who advises his subordinate Wormwood about how to undermine faith and promote sin within mankind. Another quote from the letters could easily be construed as to be about watches and how it's never one watch that sends you deep in collecting and learning more about horology is a slow process over many years. "The safest road to hell is the gradual one - the gentle slope, soft underfoot, without sudden turnings, without milestones, without signposts". What is rather unique to the Cherwell is the engraving on the crystal which I can only recall seeing on a handful of watches. In white text it reads "Hand Wound Movement ST3621 - OG | GF - Cherwell First Edition Designed In Great Britain". The OG and GF are the initials of founders, Oliver Goffe and Gordon Fraser. It might not have been deliberate but I like the honesty of the engraving as it says designed rather than made in Great Britain. Having spoken to British Clockmaker James Harris a few week ago, he felt that companies like Bremont play fast and loose with the term "Made in Britain". The Cherwell is very upfront about the origins of it's movement and whilst it takes inspiration from aspects of England, it is designed and not made there. It would have been very easy to use more flexible language in respects to the source of the movement and manufacture so I really do appreciate the transparency, intentional or not. The movement is the Chinese Seagull ST3621 which is a hand wound movement. 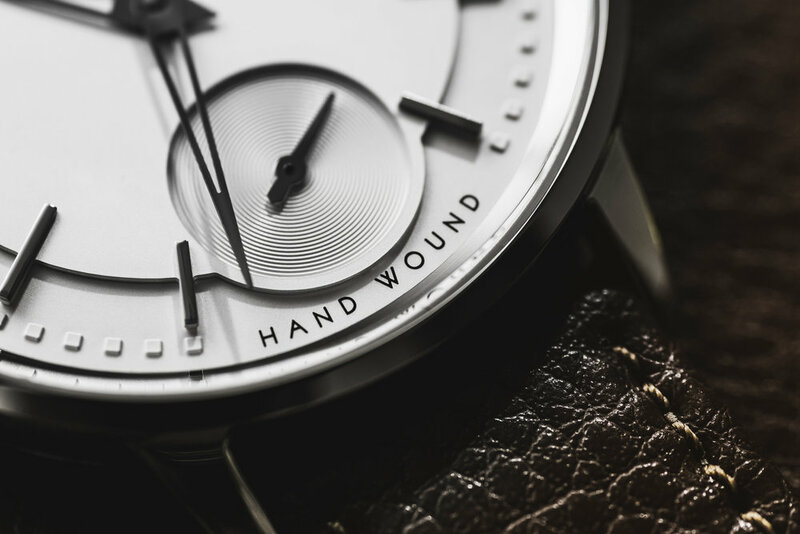 Oliver says that the reasoning behind choosing a hand wound over an automatic was that it creates much more of a connection with the watch. The lazy might be dissuaded by having to rely on the winding ritual every morning to keep time flowing however it has never bothered me all that much. There is some nice engraving on the movement which adds some nice visual interest which is always welcome when a rotor is not present to distract from a plain movement. The power reserve is just over forty eight hours which is long enough to allow a few lapses of winding in the early hours. I'm sure Oliver and Gordon are rather keen to see what the future holds in regards to how successful their Kickstarter will be but as time moves at the same speed for all of us, a little more waiting is required. If you enjoyed this article then by signing up to the Timepiece Chronicle newsletter you can get weekly updates sent straight to your Inbox. Never miss an article again! ShowcasesBen Newport-Foster December 15, 2015 Marloe, Kickstarter, Cherwell, Seagull, Marloe Watch Co.